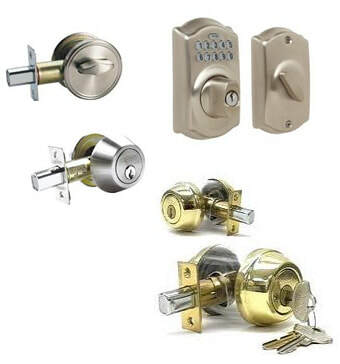 Commercial Lock & Safe offers a wide array of door hardware. 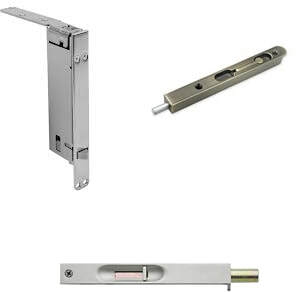 Many items such as door closer, locks, flush bolts, door hinges, exit and panic devices are available in our store. 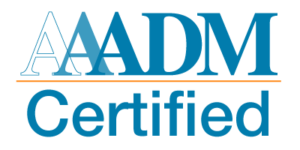 Please call us for more information on any particular door hardware. A door closer is a mechanical device that closes a door, in general after someone opens it, or after it was automatically opened. 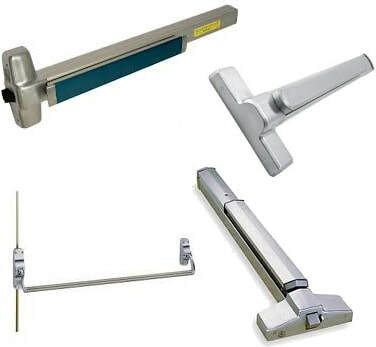 Choosing a door closer can involve the consideration of a variety of criteria. In addition to the closer's performance in fire situations, other criteria may include resistance to opening forces (for use by disabled or infirm), control over the rate of closing, safety, durability, risk of vandalism, and aesthetics. A lock is a mechanical or electronic fastening device that is released by a physical object (such as a key, keycard, fingerprint, RFID card, or security token) or secret information (such as a keycode or password), or combination of more than one of these. Flush bolts provide extra security against intruders. It also provide safety preventing younger children from opening a door. The bolts mount in the edge of a door at the handle side can be operated manually with a small lever or automatically. Flush bolts are available in a variety of styles and finishes at door outlets and most home centers. 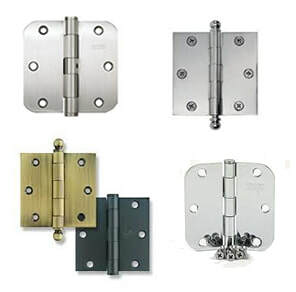 We offer a wide aray of door hinges in our store. Panic Devices are required by federal OSHA (Occupational Safety and Health Administration), and municipal code in the United States for situations involving means of egress for those entities complying with the National Fire Protection Association's (NFPA 101) Life Safety Code, as well as with the National Electrical Code (NFPA 70) requirements. Additionally, some municipalities require this hardware when an occupancy is considered 'hazardous', as in the case of chemical storage facilities.